When South Australian grower, Darren Longmire required precision seeding with a width and a high trash clearance saw, he turned to Flexi-Coil who provided him with a 5500 model air drill and three bin 4350 air cart combination complete with hydraulic tynes. It is essential for Darren to get his seeds into the ground before the end of May regardless of rainfall or risk his crops being affected by the cold June and July night time temperatures. The combination of 5500 air drill and 4350 air cart is ideal, offering both outstanding efficiency and accuracy. The Flexi-Coil 5500 air drills are available in widths of 18.3 m or 21.3 m. They feature a patented 2 piece wing with simple, parallel circuit hydraulics and exceptional land following flexibility for precise placement of seeds. The wings are attached to a collective allowing them to closely follow the ground, minimising stress to the framework. The 4350 air cart is ideal for growers who need to apply large volumes of seed and fertiliser in a single operation or need a large capacity and diverse metering abilities. 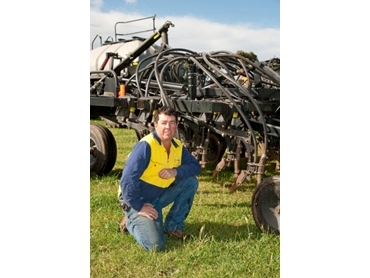 Darren explained that the air drill and air cart seeding combination is ideal for his needs. It allowed him to control seed depth in both wet and dry sowing, even in very sticky black soils. It also allowed Darren to increase safety using a smaller transport width whilst achieving a wider seeding width, which was preferable with all the narrow, winding roads and bridges in the area. The 5500 air drill unit folds down to a width of just 5.4 metres. Darren says the air drill achieves exceptional ground following even on steep side slopes. He used hydraulic tynes on the 5500 air drill along with 3-inch, flat rubber press wheels. This enabled more accurate dry sowing and an increased trip pressure up to 250 kg for less wear and tear.